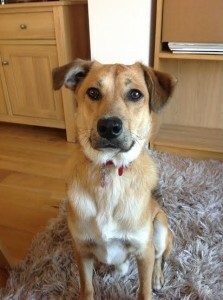 Toby is a gorgeous 10-12 month old medium sized Crossbreed. He is a fab young boy with loads of cheeky character looking for an active home who can keep him busy! He loves other dogs, but does get very OTT around them when playing! 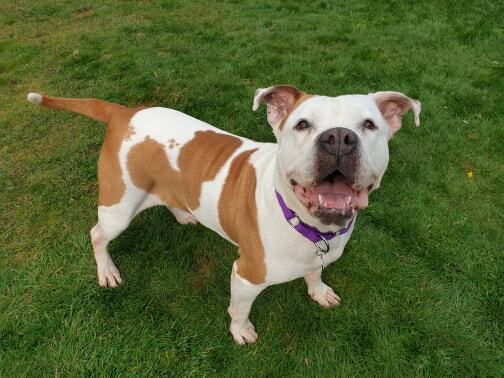 He’d enjoy living with another playful dog around his size who will tolerate him always wanting to play, but also put him in his place when needed as he definitely needs to learn some manners! Toby already has lots of basic training – he know his commands, walks nicely on the lead, is fully housetrained and is fine to be left for up to 4 hours at a time. His recall when off lead still needs some work as he is easily distracted! He can get very over excited if allowed, and does mouth/nip when he gets excited, so would be best in a home with no children under 12. There is no malice to this, but it is too much for young children and something that needs to be worked on. Toby needs an active home, with secure garden (6ft fencing) who can give him plenty of attention and exercise.